Amazon Locker is a new delivery option offered by Amazon which provides secure, self-service pick-up stations located in a select number of cities in the US and UK. Once your package is delivered to the Amazon Locker, you receive an e-mail informing you that your package is available for pick-up. This Amazon service came about 1 year after a Canadian startup called BufferBox started offering a similar secure dropbox service. BufferBox has lockers installed in two locations in Waterloo, one at the university and another a nearby corporate office. The company is nearing a launch in Toronto and plans to roll out lockers across Canadian and U.S. cities. But back in 2000, another Canadian company launched a similar service. On July 24, 2000, Canadian property management company Oxford Properties Group launched a startup called EMPORI.COM. Customers could order products from affiliated online retailers via Empori.com, which were then delivered on the same or next day to a secure depot containing lockers. The original depot was located in an office building in Toronto (Royal Bank Plaza) and over the course of a year this expanded to three more sites around Toronto. Oxford Properties Group saw this as a way for their commercial real estate customers to get additional value out of their prime inner city locations. The idea was that city workers would order products online and then, after receiving an email notification with the locker location and locker combination, would pick their order up at the end of the day, on their way home from work. A host of a products from 31 vendors were offered, from books to running shoes to groceries and even liquor. From the launch press release: "Empori.com is the one-of-a-kind retail solution to those barriers that discourage people from purchasing online. Our delivery system addresses the online shopping fulfillment problem." 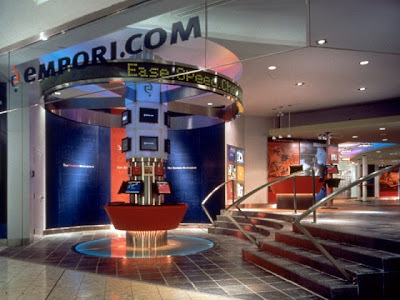 Less than 1 year later, on July 17, 2001, Empori.com closed after a $5 million loss. The blame was initially placed on the general business environment which included the bursting of the dot com bubble: "With recent changes in the dot-com environment, [Empori] was unable to find another strategic and financial partner to support further development of the business-to-consumer business,"
As the dust settled it looked like the single biggest factor in Empori’s failure was its inability to secure a critical mass of online retailers. They tried to do too much - secure depots for pick-up was only one piece of their ambitious plan - they were also reselling goods via their website, which was the sole point of contact to access their secure depots. In effect they were trying to launch a new online retail site, coming off a base of zero customers, while in the general dot com gloom of 2000/01. Maybe what they should have done is to focus solely on their unique selling point - the secure depot - and offered it as a service, available to any online retailer, much as BufferBox is doing today. As of today, the Empori.com domain name is offered for outright sale for €3540 ($4351) by a European domain reseller. "Empori" is Italian for "Stores".